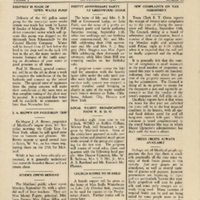 Original 4-page newspaper edition: The Maitland News, Vol. 01, No. 20, September 18, 1926: Newspaper Collection, accession number 2014.002.020V, room 2, case 2, shelf 10, box GV, Maitland Historical Museum, Art & History Museums - Maitland, Maitland, Florida. Digital reproduction of original 4-page newspaper edition: The Maitland News, Vol. 01, No. 20, September 18, 1926. “The Maitland News, Vol. 01, No. 20, September 18, 1926.” RICHES of Central Florida accessed April 25, 2019, https://richesmi.cah.ucf.edu/omeka/items/show/5543.